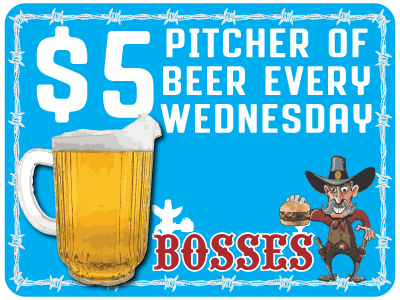 Bosses has ice cold beer pitchers all day on Wednesdays for only $5! With a wide variety of beer on tap, we have the beer for you! This offer is a great time to get together with friends and family. Be sure and order some Potato Skins or some Fried Cheese with your pitcher. In New Braunfels? After your trip down the Guadalupe or Comal River, stop on in and quench your thirst. Friendly atmosphere, good music, and cold beer may be in your future if you stop by!